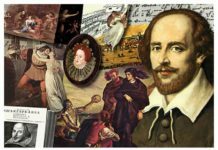 There are people who think it is a sign of scholarship and literary taste to suggest that Shakespeare was not original and that he borrowed plots. Of course he made use of the work of others .Every writer has to use the work of others.The only question is how the accomplishments of other minds are used whether as a foundation to weave better verses charged with emotions or whether like a thief to make a reputation for himself. Thousands of people have stolen stones from the Coliseum to make huts.Similarly thousands of writers have taken the thoughts of others with which to adorn their works. They are plagiarists.But the man who takes the stories of others, adds to them, and gives them intensity of of poetic form, sublime thought, and powerful emotions is in the highest sense original. Shakespeare did borrow stories for his plays( except “Love’s Labour Lost” “The Merry Wives of Windsor””, “The Midsummer Night’s Dream” and ” The Tempest”) from various sources, like Chaucer, “Pliny’s Natural History,” “Plutarch’s Lives”, and” Holinshed’s Chronicles” but he gave them intensity of poetic form, charged with sublime emotions. The question is not who furnished the stone or owned the quarry. The question is who carved the statue. The question is not who supplied the paint, the brush and wood panel or canvas. The question is who produced the painting. The question is not who designed the violin, but who used it as a composer of great music. In this sense Phidias, Da Vinci, and Mozart are all original in their respective fields. And so is Shakespeare. Out of this raw material Shakespeare made the following great passage in Othello. “ Like to the Pontic sea. This is alchemy. Shakespeare has transformed ordinary metal into pure gold! The point is that he combined harmoniously all the dimensions of creative art, carving fantastic statues, producing exquisite paintings and composing divine symphonies. He was Phidias, Da Vinci, and Mozart, all three combined in one person. Only once in the history of a planet like ours does a star of incandescent luminosity shine over it bathing it in perpetual light, effulgence and glow. That star is Shakespeare.